– False rhubarb, rhapontic rhubarb or rhapontic, (Rheum rhaponticum). Edible species. Its leaves are used to wrap cheeses, and its rhizomes serve as food for the pigs. 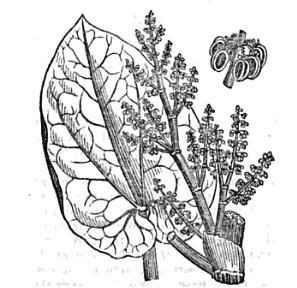 Do not confuse it with monk’s-rhubarb (Rumex alpinus L.). – Rhubarb (Rheum rhabarbarum). Edible species of rhubarb. It is believed that this is derived from the species Rheum palmatum L. and Rheum rhaponticum. The leaf petiole is consumed, while the limbus is toxic and should be discarded, as is the case with all edible rhubarb species. Generally in the markets it is commercialized without the limbo (see photo). Although all rhubarb classes have similar therapeutic properties, rhizome extracts of Chinese rhubarb (Rheum officinale and Rheum palmatum L.) are considered more therapeutic than garden rhubarb, from which roots or rhizomes are rarely used. It is currently cultivated in several countries as edible vegetable, especially in the United States, the Magellan region, Eastern and Central Europe. 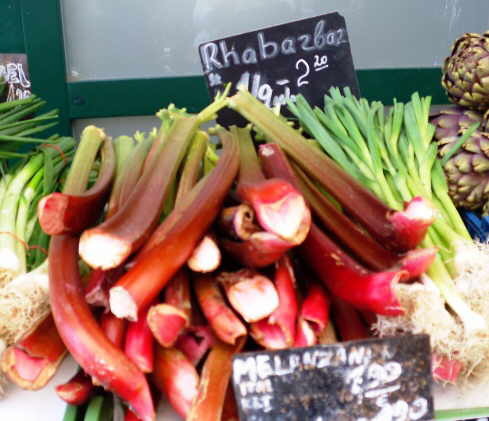 In the image: bunch of rhubarb (Rheum rhabarbarum) at Naschmarkt market, Vienna. – Rhubarb from France (Rheum compactum L., Rheum nutans Pallas.). Edible species. Cordiform leaves, dark greenish, and smooth on both sides. Semi-cylindrical leaves stems with a raised rib on each side. Large stems semi- branched. Yellowish white flowers growing in panicles. It is recognized by its reddish or pinkish white, odor of raphontic (common in Rheum undulatum and Rheum rhaponticum). It is used for commercial purposes by the consumption of its petioles. It produces must, wine and preserves. At the therapeutic level it is used for its purgative, tonic and vermicidal properties. 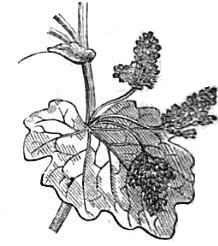 In the image above: detail of the leaves and inflorescence of Rheum compactum L.
– Syrian rhubarb, currant-fruited rhubarb, warted-leaved rhubarb, rhubarb of Babilonia (Rheum ribes). Edible and medicinal. It is a common rhubarb in Lebanon and Persia. Characteristic species due to its fruits wrapped in red and succulent pulp. Stems strong and striated, in its base medium-petiolate leaves. Large limbus, 65 centimeters wide and 33 centimeters long. Rough and verrucous surface. Wavy and frizzy margins. Nerves covered by rough hairs. It is used as a food and medicinal plant. You can buy it at local markets. – Chinese rhubarb, rhubarb root, Turkish rhubard, Indian rhubarb, Russian rhubarb, Da Huang (Rheum palmatum L.). Medicinal species. It is a plant native to western China. The first documented consumption of rhubarb dates back to China in 2,700 BC, then it was consumed for medicinal purposes. Species closely related to Rheum officinale Baillon as well as its medicinal uses. It is characterized by rough and webbed leaves of large size and showy greenish purple. Size much larger than garden rhubarb (Rheum rhabarbarum). Its first buds are yellow, unlike garden rhubarb, that its buds have a reddish color. It is used for the preparation of Essiac tea, with supposed anticancer properties. Some varieties are: Atrosanguineum, Bowles Crimson. 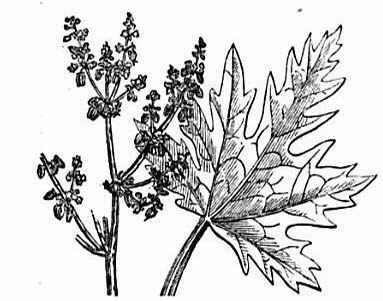 Medicinal properties similar to the species Rheum officinale (below). Detail of the leaf and the inflorescence of the species Rheum palmatum L.
– Chinese rhubarb or Tibetan rhubarb (Rheum officinale Baillon). Medicinal and ornamental species originating in East Asia and Tibet. Medicinal plant used by its rhizome as laxative, astringent, tonic, refreshing and stomachic. Very similar to the edible variety Rheum rhabarbarum. Toxic leaves. Traditional plant in China, whose dried root is used as a medicinal plant in Traditional Chinese Medicine. Its applications in this medicine are purgative, and to tone the meridians of the Heart, Small Intestine, Liver and Stomach. It is also used for toothache as it contains at least six analgesic chemicals. For this application, the root is fried and infused into alcohol. With the help of a cotton wool, this solution is applied to the sore tooth. – Rhubarb of the Himalayas (Rheum australe Colebroke and Rheum emodi Wallich). Medicinal species. Very high and with yellow flowers. heart-shaped large Leaves. It is used in Ayurvedic medicine in India, and grows in the mountainous regions of the Himalayas. It was formerly cultivated by the English in Calcutta. Leaf detail, the inflorescence and the fruits of the species Rheum emodi or Rheum australe. – Nakai, Korean rhubarb (Rheum coreanum). Medicinal species. Originally from Korea and East Asia. It is used for medicinal and non-food purposes, its rhizomes are laxative and stomachic. – Alexander’s rhubarb (Rheum alexandrae). An ornamental species characterized by tall spikes of flowers that rise from the ground between 1 and 1.25 meters. In autumn it acquires a spectacular red color.